Oakhurst Neighborhood Association, Fort Worth, Texas: June Oak Leaflet Online Now! Check out this month's issue of The Oak Leaflet online! 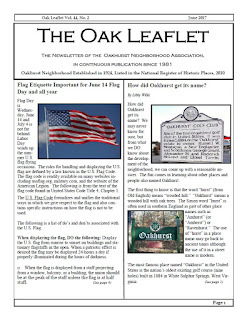 This month's newsletter reminds of us of proper etiquette for displaying the American flag, considers the question of how Oakhurst came to be so-named, and includes an ONA 2017-'18 survey for all of our neighbors to provide feedback! Also featured are Elizabeth's President's Column, Fred's monthly patrol report, Fran's Yard of the Month, pictures from the Easter event, and more!